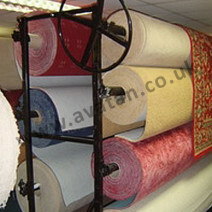 Avatan Handling Equipment offer a range of static and mobile carpet racks and vinyl racks. Single sided display stands racks and double sided Island stands are available for both carpet and vinyl, and may be mounted on heavy duty swivel castors in order that the racks may be easily and efficiently pushed into the tightest of spaces. 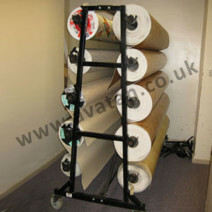 These racks are offered to suit different numbers of carpet and vinyl rolls and different lengths of roll. Ideal for point of sale display purposes. The easy to assemble Carpet and Vinyl display frames are supplied ready for customer self assembly with all nuts, bolts, clamps, etc. supplied as required.